"To say that these are universal problems is to assume that we are solving Africa's problems. No! This should be about our concern for South Sudan as South Sudanese. We are not Somalians or Congolese." 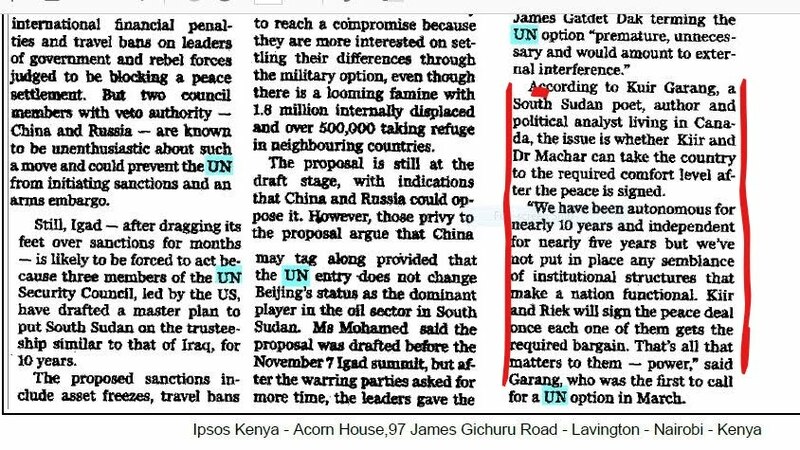 In 2014, following SPLM’s leadership political indecisiveness and power struggle that’d plunge South Sudan into both political and military confrontation, the talk on UN Trusteeship or Joint Administration gained traction. But like any sociopolitical phenomenon, the idea was received with mixed reactions by South Sudanese intellectuals, political elites and policy institutes. Obviously, the reason for this mixed reaction seemed facts-based; but it’s rather a question of our general understanding of patriotism. On March 27, 2014, I wrote an article in response to one of Sudd Institute’s ‘weekly policy briefs’ of March 11, 2014 by Nhial Tiitmamer and Abraham Awolich. And on April 11 the mentioned authors responded to my article by clarifying some of their postulates and the reason why the ‘brief’ didn’t contain thorough and comprehensive policy analysis and alternative proposals. It’s been more than two years since then; but given the despondent state of things now in South Sudan, it’s prudent that we re-start the debate in order to remind the South Sudanese leadership of their role and the wretchedness (inadvertent or purposed) that’s become South Sudan. 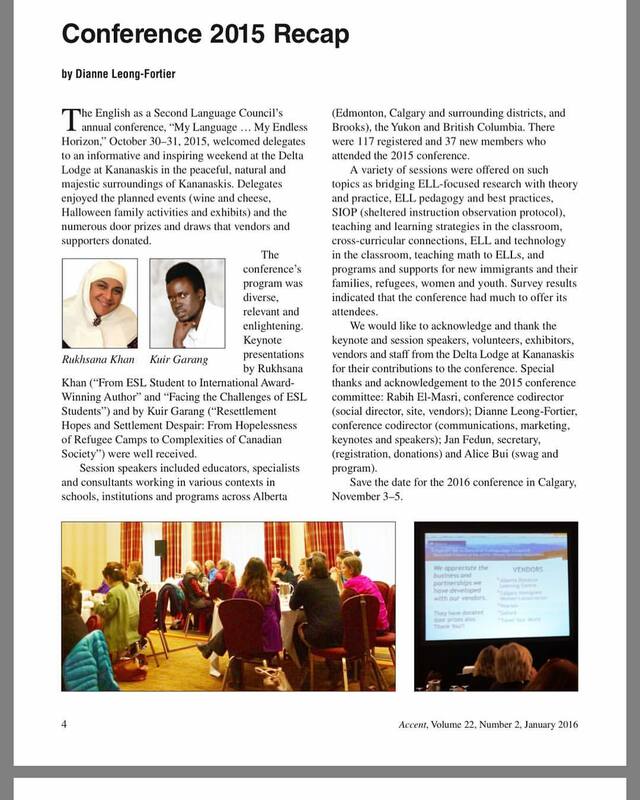 It’s our role as ‘learned’ and ‘informed’ South Sudanese to speak for the voiceless. It is, unequivocally, our duty to remind South Sudanese intelligentsia that criticism and the analysis of what’s wrong with the political class and the general ideological leaning, is the heart of patriotism; the pivotal center around which national well-being revolves. While I am not going to respond to Nhial’s and Awolich’s article word by word, I am going to answer some of the questions they raised; or some of the issues they believed I didn’t address. Since this is about policy recommendations and our aspirations for South Sudan’s sociopolitical future, it’s crucial that we honestly debate the fate of the country in an exhaustively informed manner. Besides, unfortunately, the very conditions that necessitated the debate on Joint Administration and Trusteeship are exactly the same way we first debated them two years earlier or even worse. And even worse, the prospects of any better future are even beleaguer. I used the word ‘insulting’ to underscore the fact that having our country taken over and ruled (even for a short time) by a committee of both foreigners and South Sudanese obviously gives an impression to the outside world that we are an incapable lot. Admittedly, it’s a state of affair which, in all honesty, insults people’s sociocultural realities, their sociopolitical creative capacities, and their intellects. However, I said the two proposals aren’t ‘outlandish’ because there’s nothing strange, bizarre or peculiar about South Sudan being taken over by a different administrative body given our existing, hopeless realities. And these realities are hampering any formidable developmental path towards the South Sudan we had all hoped for. Fortunately, the authors realized that their usage of the term ‘outlandish’ was in fact inappropriate. “Perhaps it is a mistake on our side to have chosen such a word without explanation or definition. We think the two proposals are not insulting. They have been proposed out of context,” they wrote. Inappropriate or inapplicable, should have been the terms used instead of outlandish. I see myself as a reasonable South Sudanese so I didn’t recommend the proposals by then because I believed South Sudan still had the capacity to remedy the situation and change the course of things towards the future we crave. Essentially, things don’t have to be perfect for one to believe that socioeconomic and sociopolitical situations would improve. What’s important are the indications that such a case is a possibility. With peace negotiation on-going then, I assumed a signed agreement after the military crisis would change our mindset; and that a brighter future was a possibility. We can all attest to the fact that that’s not a possibility anytime soon. That, I assume, is clear. As policy institute scholars, their main goal should be the synthesis of policy ingredients into potentially useable policy products. We should always write to make things easy for our policy consumers not make them do our work. 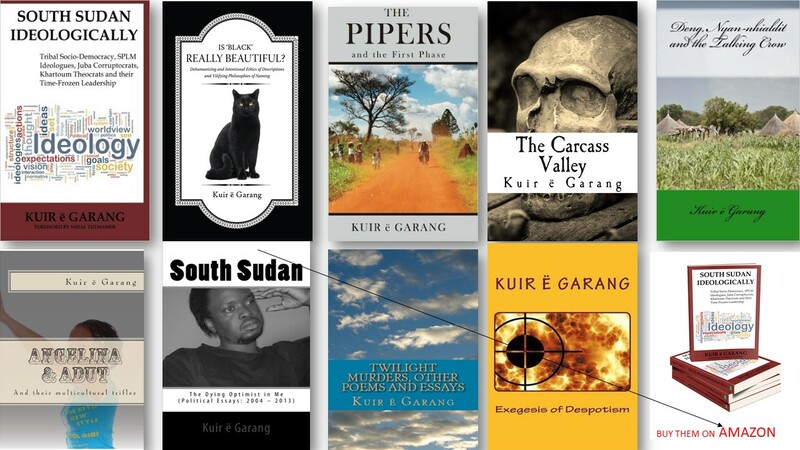 Besides, the context with which we [South Sudanese] write might not be the context with which the authors we refer people to, do. 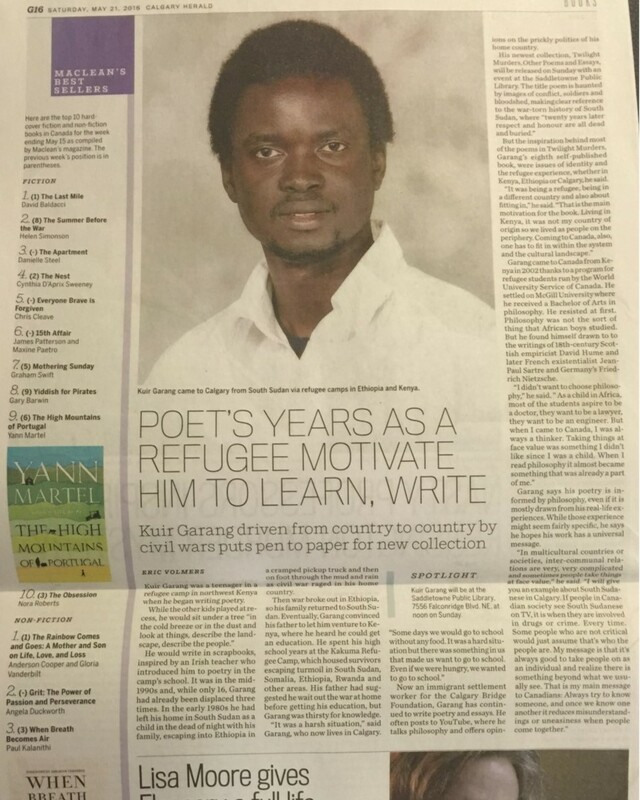 While it’s crucial and expedient to point readers to the original article, it’s imperative that the authors put the merits not only in their own words but also in their context as South Sudanese. To say that “X has already written about merits so go and read them; I’ll here write about demerits” is rather an odd intellectual stance for policy institute scholars to adopt; and I hope that that is corrected for the benefit of the institute’s readers like me. Admittedly, this is where the authors seem to have a point when things are taken strictly on face-value without rationalized context in regard to South Sudan. Given the fact that the world had just come out of the horrors and madness of second world war, and many colonized peoples were fighting for independence from their colonial masters, it’s obvious why such a clause was necessary. That chapter XII could be used as a pretext by some nations to ‘legally’ occupy and recolonize others was a reality. A respect for sovereignty of others was meant as a protective clause for UN member states. However, we need to remember that Chapter XII (“International Trusteeship System”) was initiated as a solution-focused idea to deal with a given problem. “The United Nations shall establish under its authority an international trusteeship system for the administration and supervision of such territories as may be placed thereunder by subsequent individual agreements. These territories are hereinafter referred to as trust territories,” Article 75 states. To argue that it should always be applied in the manner in which it was initiated without context is to lose sight of the content of the problem we are talking about. We always need to remind ourselves, as South Sudanese, as to why we are even talking about Chapter XII. Did it occur to the authors [Nhial & Awolich] that Chapter XII, Article 78, can be amended to include sovereign states in extremely special circumstances? Isn’t the severity of the problem and the fact that South Sudanese leadership has failed to even show a single way-forward not enough to alarm us? South Sudan is leading nowhere and what we need to talk about now isn’t the fact that “Most fragile states should have been put under the UN trusteeship system, if fragility is an automatic invitation for the UN to take over a country.” We need to think about what can help end death, political instability and economic hardship in South Sudan. Thinking about why certain solutions aren’t proposed for other fragile states (such as Somalia and Congo DRC for example) is to believe the problem in South Sudan isn’t severe enough yet. And why do we worry about other states? It’s neither our problem that they are in crisis and neither is it our problem that they’ve never considered “International Trusteeship System”. We need to think about quintessential realities of our nation and our problems. I can entertain the argument that Joint Administration and Trusteeship cannot work in South Sudan with reasons given. To say that these proposals were presented out of context as the authors had argued, is to ignore the central article of Chapter XII (76). However, the argument that Chapter XII doesn’t apply to our realities in South Sudan is to lose sight of the fact that laws are made, nullified and remade. This therefore takes care of the legality question. I always assume that the gravity of the problem affects us in the same manner so to say that “the two proposals we assessed do not provide convincing proofs” troubles me. 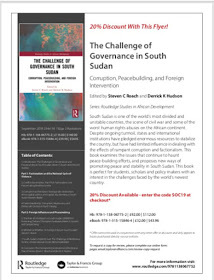 I know the two authors, more than anyone I know, care deeply about South Sudan and they understand the gravity of the problems South Sudan is in more than many of us. However, I don’t know if they realize the impression they convey by saying that there’s no convincing proofs for the two proposals. Two questions present themselves in this context. Is what isn’t convincing the viability of the two proposals as possible solutions for the problem, or the fact that things are not yet bad enough for us to consider things like trusteeship? 2. Security officials intimidate opponents and the media if they don’t toe the government line. 5. There are no functional institutions and structures for sound decision making. 7. Government officials say what they want and do what they want. So to argue that there are no ‘proofs’ is to either be in denial or believe that things need to get worse than they already are now. This would be a terrible state of affairs as South Sudanese have suffered in the most grotesque manner possible. We need to conscionably look at the suffering of South Sudanese to realize that we have convincing proof that alternative methods of governing South Sudan are necessary now. Our suffering civilians are proofs enough. Unfortunately, these, in my view, aren’t alternatives but what any conventional government SHOULD perform or aim to achieve if it isn’t doing them yet. To call them alternatives is to assume there is something else a government should do. Viable alternatives aren’t merely prescriptive itemizations, which the current government should execute. South Sudan needs more than that. The leaders have proven beyond any reasonable doubt that they have neither the will nor the capacity to implement any of the ‘alternatives’ the authors mentioned. What’s required in South Sudan is a complete overhaul of the top governance system and decision-making infrastructure. Assuming that the current leadership will perform the above tasks is to still have confidence in the current leaders; and to still entrust the future of South Sudan and lives of the people into the hands of two men who’ve shown total disregard for human life. President Kiir recently compared the genuine grievances of the citizens to football fans’ complaints about the performance of the players. That’s to take the lives of the people and their suffering lightly, a dangerous state of mind for a national leader. Dr. Riek Machar asked Stephen Sucker of BBC ‘Hard Talk’ in 2014 who he should apologize to, saying with straight face that “I am the victim.” These two men can’t work together and they have shown that building military strength around them is their primary objective. Are these the people to implement these ‘alternatives’ or are we expecting a miraculous change in their mindset? The problem in South Sudan isn’t merely what is to be done but WHO is to do it. And to argue that “South Sudan has been under a UN Mandate in the last 9 years with little to show in terms of political and social stability in the country” is to assume that the UN has a greater role in the actual governance than it actually does. I need to first remind my readers that should South Sudanese leaders change from self-interested stooges and in their obsession with quest for power and riches at the expense of the people, it would be ridiculous for me to talk of the above two proposals. We are talking about these proposals, not as the ultimate solutions, but as viable alternatives that can give South Sudanese a small room to build their country. While Trusteeship or Joint Administration wouldn’t be the ‘magic wand’ that’d solve all our problems, there’s a very patriotic, conscionable reason why I would now recommend them. If the instituted leadership under the mandate of the would-be initiated clause under amended Chapter XII reports to the UN General assembly on regular basis on how developmental money is used, the chances of national funds being misappropriated would be minimized. Most of the development dollars would go to the purpose for which they are intended. Money for roads, hospital, schools, and salaries would easily and transparently go towards the purpose for which they are intended. Decision-making now in South Sudan is concentrated in the hand of the president and a few trusted individuals. This allows junior officials who believe the president would back their wild thoughts to say what they want whenever they want. 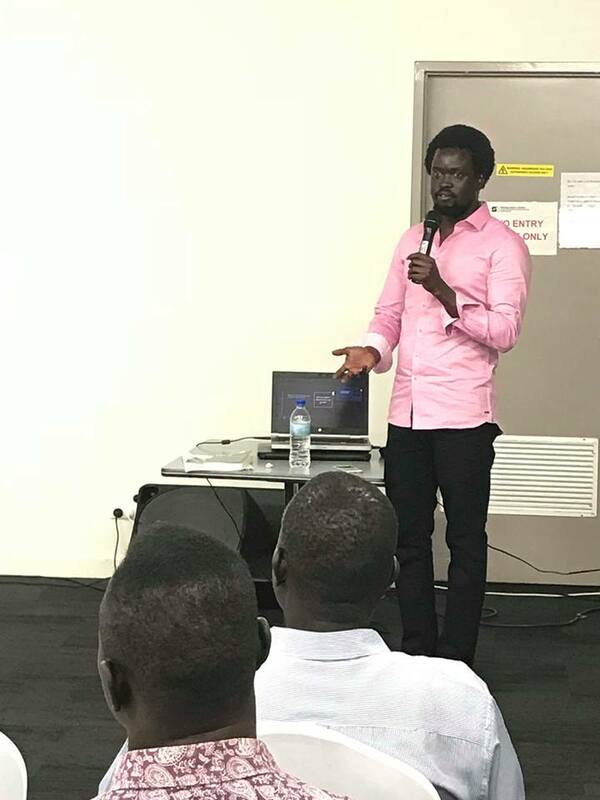 Under the guidance of experts, South Sudanese officials would learn to treat the functionality of institutional structures and administrative protocols based on researched facts as sacrosanct. Impulsive decision-making based on whims would be avoided and new decision-making methods and apparatuses learned. In a situation where a presidential spokesperson overrules two Vice Presidents because he belongs to unquestionable tribe, a nation leads nowhere. Insecurity in South Sudan is caused by lack of accountability. And this lack of accountability stems from the tribalized nature of the security sectors. Having a person no tribe would accuse of favoritism would be a sound way to make sure the national security sector is not only overhauled but also de-tribalized. The president has his own brand of body guards, who seem to fall outside the regular South Sudanese army. This forces Vice President Riek Machar to copy the same by having his own brand of body guards. All these contribute to insecurity by fomenting mistrust and fear. The leaders should have a non-tribal secret services to guard them. The historical link between SPLA, which is supposed to be the national army, and SPLM, which is the ruling political party, has proven to be problematic. A Joint Administration or Trusteeship would make sure the way SPLA meddles in the political affairs of the nation is completely checked. Our current leadership isn’t able to ensure that the SPLA doesn’t interfere in political affairs because many politicians use this historical tie to make SPLA an intimidation tool. Most of SPLM's politicians are army generals. Media is one of the mirrors of society and it’s one way through which government’s performance is discussed. The current leadership sees the media as an enemy rather than a tool to evaluate its performance and inform the nation through unbiased news reporting. Besides, the manner in which opinion writers and people with different opinions are intimidated or killed, compromises the development of sound national conscience and moral consciousness. Nations develop when different ideas are allowed and available governance ideologies critiqued thoroughly. This isn’t an atmosphere that’s possible now. South Sudanese constitution has guarantees that could ensure the nation develops soundly and freely. Trusteeship or Joint Administration would be led by people who value laws and can apply them rather than using them as smokescreen while using informal, unwritten laws to run the country. I don’t suggest these things because I don’t care about our sovereignty or the well-being of our civil population. I suggest these proposals because the suffering of our people has become unbearable to me and I don’t see any way forward with the current leadership. This makes it inconceivable that the said ‘alternatives’ have any leadership or structure to implement them. With this in mind, Mandani’s question becomes imperative: “Is it possible to put together a political authority with the credibility, the vision, and the experience for a task that combines elements of tutelage with that of a democratic project?” The answer is yes! But the question is the composition of such a ‘political authority.’ The nature of this ‘political authority’ can easily be instituted by the UN, Troika, AU and IGAD and South Sudanese technocrats. This is a response to a response to my response to an article written by Sudd Institute in March of 2014.